Digital media is changing how I do my work as a scholar. How I work today bares little resemblance to the way I was trained as a scholar, but has everything to do with being fluid with both scholarship and digital technologies. To illustrate what I mean by this, I describe the process behind a recent article of mine that started with a Tweet at an academic conference, then became a blog post, then a series of blog posts, and was eventually an article in a peer-reviewed journal. My article, Race and racism in Internet Studies: A review and critique (New Media & Society 15 (5): 695-719), was just published in the August, special issue of New Media & Society on The Rise of Internet Studies, edited by Charles Ess and William Dutton. The germ of an idea for the paper began at the American Sociology Association Annual Meeting in 2010. I attended sessions about online discourse and, given my interest in racism in online discourse, I kept expecting some one to bring up this issue. I was disappointed by the lack of attention to racism, or race more generally, in the sessions I attended, and Tweeted that observation, using the hashtag of the conference (#asa2010). When I consulted the program for the conference I was truly perplexed to find that the only session on race and digital media was the one I’d help organize. In a lot of ways, a Tweet is just a “soundbite” in 140-characters of text. And, as the astrophysicist Neil deGrasse Tyson suggests, there’s nothing wrong with a soundbite, especially if you want to reach a wider audience than just other specialists in your field. That one Tweet – and the lack of scholarship it spoke to – got me thinking about the kinds of sessions I would like to see at the ASA and the sorts of things I thought sociologists should be studying in this area, so I wrote a blog post about it, “Race, Racism & the Internet: 10 Things Sociologists Should be Studying.” As I usually do now, I shared that blog post via Twitter. I got many responses from people who shared their work, and the work of their students, friends and colleagues, with me in the form of comments to the blog or @replies on Twitter. The suggestions for further citations came from people I know almost exclusively through our interactions via the blog or Twitter. That feedback from geographically-remote, institutionally-varied yet digitally-close colleagues got me thinking about expanding that single blog post into a series of posts. I wanted to review the wide-range of interdisciplinary work happening in what Ess and Dutton call “Internet studies.” Why bother with this, one might reasonably ask? Central to this new workflow of scholarship is the blog, Racism Review (RR), which I started in 2007 with Joe Feagin, a past president of the ASA, with the goal of creating an online resource for reliable, scholarly information for journalists, students and members of the general public who are seeking solid evidence-based research and analysis of “race” and racism. The blog has very much become part of “how to be a scholar” in the current, digital moment. I use it to post first drafts of ideas, to keep up-to-date on the research literature, and since I firmly believe that writing is thinking, I often use it to work out just what I think about something. The blog has also become a way to support other scholars both in their research and in teaching. A number of academics have told us that they use the blog in teaching; one, Kimberley Ducey (Asst. Prof., University of Winnipeg) uses RR blog posts in an instructor’s manual for a traditional intro sociology textbook as lecture suggestions, in-class activities, and essays/assignments. Through the many guest bloggers we host, I learn about other people’s scholarly work that I might not otherwise know about. And, the blog has become a mentoring platform, where early career scholars often get started with blogging and then go on to create their own. The blog is also content-hungry, so I’m always thinking about scholarship that might make an interesting blog post. So, back to the series of posts. From late February to early March, 2011, I did a series of blog posts that expanded on the initial “10 Things,” post from August, 2010. Those posts were all about the current scholarship on race, racism and the Internet with each one focusing on a different sub-field in sociology, including: 1) Internet infrastructure and labor force issues; 2) digital divides and mobile technology; 3) racist social movement groups; 4) social networking sites; 5) dating; 6) housing; and 7) the comments sections of news and sports sites. This last area, racism in comments sections, prompted a research collaboration with one of the presenters from that 2010 ASA session I organized. The paper from that project eventually appeared in the journal Media, Culture & Society. At about the same, there was a fortuitous Call for Papers for the Ess & Dutton special issue on Internet studies at 15 years into the field. So I combined all of the blog posts into one paper, and thought more about what my critique of the field as a whole might be. For that critique, I ended up revisiting some of Stuart Hall’s earlier writing about the “spectacle” of race in media scholarship and incorporated that with elements of Joe Feagin and Sean Elias’ critique of “racial formation” as a weak theoretical frame for Internet studies. The paper went into an extended peer review process, I revised it once, and it finally appeared (online ahead of print) in December 2012, and in print in August, 2013. Except for the very end of this process – submitting the paper to the journal for peer-review – none of this way of working bares the least bit of resemblance to how I was trained to be a scholar. My primary job as an academic is to create new knowledge, traditionally measured by the number of articles and books I produce. Traditional graduate school training has taught us to think of a “pipeline” of notes, posters, conference papers, journal submissions (and/or, book proposals), revisions, resubmissions and finally, print publication. For me, how to be a scholar now is completely different than when I went to graduate school because of the way that digital media infuses pretty much every step. This process I’ve described here – from Tweet at an academic conference, to a blog post, to a series of blog posts to a paper that became an article – is just one of many possible iterations of how to be a scholar now using digital media. Other permutations of how to be a scholar now might include live Tweeting an article you’re reading. Sometimes, when I get pre-set “alerts” in my email about newly published scholarship I’m interested in, I will share a title and a link via Twitter. If, upon reading further, I find the piece especially perspicacious, I may share select sentences via Twitter. If it happens that there’s a current event in the news that the article can help illuminate, then I’ll draft a blog post that incorporates it. My experience with the germ of an idea shared as a Tweet at an academic conference that became a blog post, then a series of blog posts, and (eventually) a peer-reviewed is just one example of the changing nature of scholarship. From where I sit, being a scholar now involves creating knowledge in ways that are more open, more fluid, and more easily read by wider audiences. ~ This blog post originally appeared at the LSE Impact Blog. Sorry for the interruption in posts here about racism, but the blog admins have been busy with other pressing demands. Joe’s away writing a new book, Jessie has been writing and administering several new grants, as well as teaching. *Thanks David J. Leonard for catching the typo. More info here. 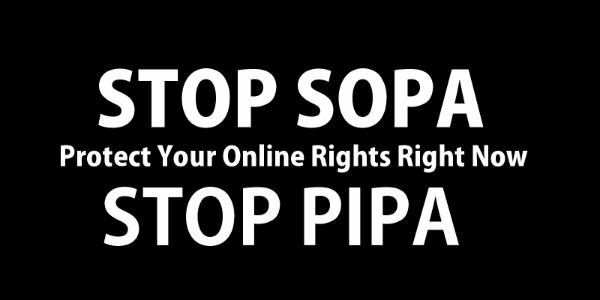 Five Things you should know about SOPA / PIPA from Colorlines. Our goal here at Racism Review is to inform, engage, educate, and whenever possible, create an atmosphere for lively discussion in the comments section. However, given the anonymity of the Internet (among many other factors, including the competing pulls on the blog admins’ time) this is often difficult to do. Therefore, in an attempt to keep down the volume of traffic from trolls and to increase the quality of discussion in comments, we’ve recently adjusted the settings on the blog so that people cannot comment on posts that are older than seven (7) days. As you may have noticed, we’ve also recently turned comments “off” on some posts. There are times when the blog admins are weary of deleting troll-comments and so, simply turn the comments off. And, if you’ve suddenly found yourself blocked from posting comments to the site, it’s because you’ve been deemed a troll by the blog admins. A troll is someone who posts comments that do not add value to the discussion but rather only serve to feed the troll’s ego and they are not welcome here. Everyone who has something intelligent, constructive, relevant, on-topic, and timely, to add to the discussion is welcome and invited to post a comment. The email subscription is activated and operational. So, if you prefer to get notification of updates to RacismReview via email we – at long last – have this capability. It’s the big space to the right there, where it says “Subscribe Now.” Just type in your email address, then follow the steps to activate the subscription. After a brief attempt to use Disqus, we’re back to managing comments through WordPress. This means that everyone will have to register (or re-register) with the site here. There are also detailed instructions HERE for those who may be new to blog registration or commenting on blogs. If you’re ready to register, you can skip the detailed instructions and go directly to registration. And now, we return you to the regularly scheduled, insightful, engaging analysis of race, racism, politics, society and culture.